Periodontal disease (gum disease) is a serious condition that can lead to the loss of bone support and eventually even your teeth. 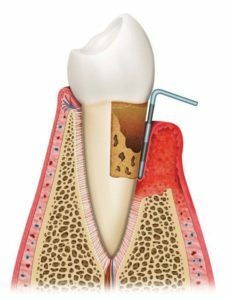 Periodontal disease happens when the gum tissue is inflamed as a result of bacterial infection. The inflammation can advance to break down the ligaments and bone that anchor your teeth in place. Addressing this condition as early as possible is the best way to retain your natural teeth. A professional deep dental cleaning (scaling and root planing) targets bacteria and debris that irritate the gum tissue. When it comes to providing scaling and root planing for periodontal therapy, we are committed to thorough procedures that allow for the best long-term prognosis. In some cases we may also need to implement procedures such as bone grafting or locally placed antibiotics like Arestin. These supplemental steps tend to improve the response to care in patients with more aggressive gum disease. Science has shown that aggressive gum disease increases the risk of many systemic health conditions. Diabetes, premature labor in pregnant women, and cardiovascular disease, for example, have all been scientifically shown to have a direct correlation with advanced periodontitis. Managing periodontitis, or gum disease, is not just a matter of treating it after it starts. You can do so much at home to improve the health of your gums and prevent gum disease from starting or worsening. By visiting our office, you will learn from our dental hygienists about the most effective ways to avoid gum disease both in your home and at our office. Properly managing your oral health is great for your smile and your body. It’s never too late to begin taking steps to improve your oral health! If you feel that you may be experiencing the symptoms of periodontal disease, then don’t wait! Please call our Edmonton, AB office today. All treatment is provided by a general dentist. For more complex cases, we often refer our patients to a specialist for treatment. Learn about braces and other orthodontic options.